Pictured are Duplex’s Barry Wilmot along with Jim Furness (left) and Mike Richards (right) from Duplex’s esteemed distributor LVC at Foodex where they teamed up to showcase models from the Duplex range. 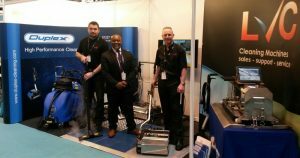 Visitors to Foodex were mesmerised by the steam cleaning technology on display and impressed with the versatility and practicality of the machines. Barry, Jim and Mike ably demonstrated the power of steam to tackle cleaning and sanitization and the considerable cost savings that can be achieved by using less water.